These are two geniune candid photos, snapped by a visitor to the set with an amateur camera. These are two different views of the same set. 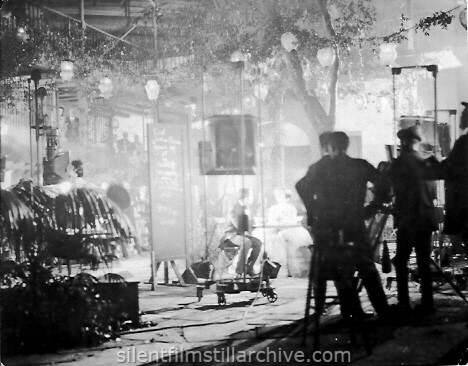 Various studio personnel are standing around watching each scene. 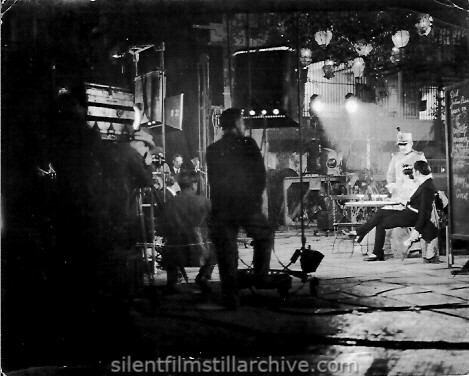 That could be director John S. Robertson in the chair with his back to the camera in the second photo. Notice the chalk board at far right. That is probably Richard Barthelmess and Dorothy Gish seated at the table in the top photo, and Barthelmess again seated at the table in the bottom photo with Anders Randolf standing at the table. with Richard Barthelmess, Dorothy Gish, Anders Randolf and Jetta Goudal. Directed by John S. Robertson. Inspiration/Associated First National.